"Along with the beauty and safety Southport affords its residents, the town is home to Dosher Memorial Hospital. Its reputation draws medical professionals from across the country to practice in the area and provide residents with high-quality health care." 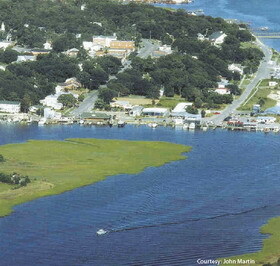 By a quirk of history, the city of Southport, North Carolina, has retained its idyllic setting to this day. Had the city fathers had their way when the New World was still new, the sleepy little waterfront town would have become the main shipping port in the region. That distinction went instead to Wilmington, and, as a result, Southport remains one of the best places in the country to retire. The town, established in 1792, was originally named Smithville, in honor of Benjamin Smith, who served valiantly under George Washington during the Revolutionary War and later became governor of the state. City leaders changed the name to Southport in 1887 to make the small port seem more like the most important port in the South. Their ploy failed, but Southport kept its new name and remained a small town, barely touched by the heavy shipping traffic that passed on its way to Wilmington. Southport was the county seat of Brunswick County from 1808 until 1975, when Bolivia claimed that honor. Today, Southport is the quintessential small Southern town, right down to its five-block, tree-lined commercial district, home to local businesses, galleries and antique shops. The residents of Southport have made preserving their rich history a priority. The 200-year-old live oaks that line many of the streets are protected by law, as are the faithfully preserved Victorian mansions found throughout town. It is rumored that some of those stately homes might have been owned by pirates who lived here because of pirate-friendly local governments. The North Carolina Maritime Museum in Southport chronicles the exploits of many of those seafarers, including gentleman Pirate Stede Bonnet's touching pleas for clemency before he was hanged. Southport's waterfront location is heaven on earth for anglers, who can cast from fishing piers or venture out from one of the many marinas to try their luck in the deep waters of the Atlantic. Along with the beauty and safety Southport affords its residents, the town is home to Dosher Memorial Hospital. Its reputation draws medical professionals from across the country to practice in the area and provide residents with high-quality health care.